We have many times outlined the importance of website loading time in our articles and explained the benefits from having a fast website. In this article we will demonstrate 5 tools that can help you check your website’s performance and speed score and identify the areas that need to be improved. A common question that many people ask is what the magic number is, in other words how many seconds is considered good? Anything less than 3 seconds is considered good, anything between 3-5 seconds is average and anything above that needs improvement. How do you improve your page loading time? Google PageSpeed Insights – A tool by Google which checks your website performance in both mobile and desktop and assigns a score out of 100. The tool makes specific suggestions for the areas that need to be improved and also makes recommendations on how to improve them. It is very easy to use and the only thing you have to do is enter the URL you want to test and click the ANALYZE button. As a general rule of thumb you should aim for a score above 90/100 for the desktop version. Have in mind that this is the score Google is using in their ranking algorithm and this is also the tool used to take measurements for reporting purposes in Google Analytics. In the majority of the cases the google page speed tool is all you need to investigate and improve your web site’s loading time. Pingdom Website speed test – A very nice tool by Pingdom which gives you details on how long it takes for each and every website component to load. This is particularly useful when you want to identify which particular components are slowing your website down. Another useful feature of pingdom is that is tells you the load time of your website, the total page size and how your website performs compared to other tested websites. Webpagetest.org – This is similar to pingdom but with the added advantage that you can select the test location and test browser. This comes handy when your target audience is in a different location than you, since you have the opportunity to run tests bases on their locations, connection speeds and browser versions. GTmetrix – Gtmetrix is another tool that provides you with recommendations based on a number of things they check during the test. In addition, it also gives you the ability to compare the performance of up to 4 urls, to download the results in a nice PDF report and it also keeps history of the different tests to measure progress or identify any serious changes that occur to your website speed from the last runs. Yahoo YSlow – A tool from the Yahoo Developer Network. Unlike the rest of the tools, this is not an online service but you have to install it as a browser extension in order to use it. If you are using Chrome for example, the YSlow is available as a chrome app in the Chrome Store. Once you install it you can run in on any website and get similar recommendations as with the rest of the tools. Fast, reliable and affordable KVM based Cloud Servers from KnownHost. It is important to optimize your website and make it load less than 3 seconds. This is not an easy process especially for the not so technical people. The five tools outlined above can help you identify what is causing the delay and in the majority of the cases they also tell you what you need to do in to order to correct the problems. For best results you can use all 5 tools but if you are running short of time then start from the top of the list and work your way down. 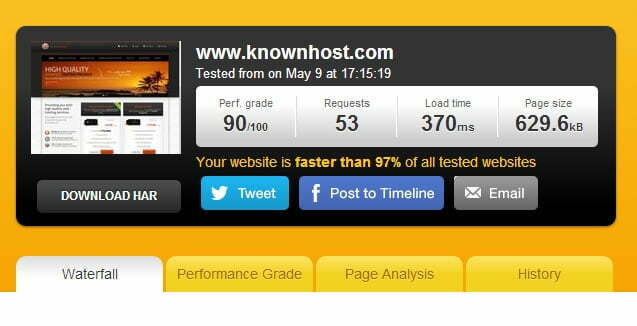 Have you put out a post detailing the best way to improve load times on your Knownhost VPS server? If not, would be really useful for us Knownhost users. Potentially you can also go a step further and do one for WordPress.